Jocelyn Décary, co-owner and director of the Complexe Hockey Balle LHCSQ de Boucherville, Jean-Philippe LaRose, cardiac arrest survivor, Mathieu Dallaire, president of Dallaire Médical, Zoll representative. Photo credit: Béatrice Trudeau-Duquette. On December 10th 2017, Jean-Philippe Larose suffered a cardiac arrest during a hockey game with friends. Athletic and living an active lifestyle, this father of three young children was facing a cardiac problem for the very first time in his life. He was resuscitated thanks to the quick action of a teammate who knew exactly what to do: call 911, start chest compressions, and use the available defibrillator (AED). Only one shock was enough to bring back Jean-Philippe. You can read more about his story in La Presse and Radio-Canada. On the 10th of April, roughly 4 months later, Jean-Philippe LaRose posed a very nice gesture that he shared on social media. We share his post here. “Did you know that it is AED Awareness Week? For this occasion, the defibrillator company ZOLL AEDs and Dallaire Médical offered me a defibrillator that I can give to the community. Today, I decided to offer it to Jocelyn and Frédéric Décary that run Dek Hockey Boucherville – LHCSQ. I believe it is significant to give it to this place, as in addition to being friends, this place hosts people like me, who practice a sport that they love. But as I learned at my own expense, nobody is immune to a cardiac arrest and this device could, perhaps, eventually save a life. It’s not nothing! Thanks to this donation, hundreds of players can play hockey with peace of mind. In short, if my mishap can help, I’ll take it. We must always see the positive in everything. 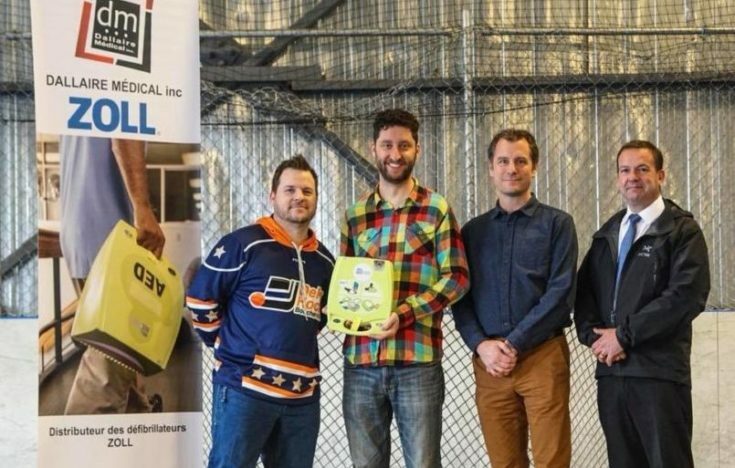 The Jacques-de Champlain Foundation commends the initiative by Zoll and Dallaire Médical and joins Jean-Philippe in wishing many safe games to all the players of Hockey Balle de Boucherville!